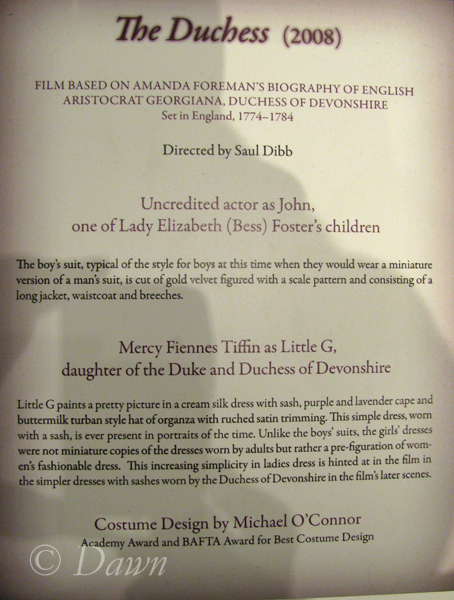 In previous posts I showed the adult costumes from The Duchess, but in the display there were also children’s costumes which were cute – but not nearly as interesting to me as some of the gowns. All the same I figured I’d share a couple of quick photos with you. The boy’s suit, typical of the style for boys at this time when they would wear a miniature version of a man’s suit is of cut gold velvet figured with a scale pattern and consisting of a long jacket, waistcoat and breeches. Little G paints a pretty picture in a cream silk dress with sash, purple and lavender cape and buttermilk turban style hat of organza with ruched sating trimming. This simple dress, worn with a sash, is ever present in portraits of the time. 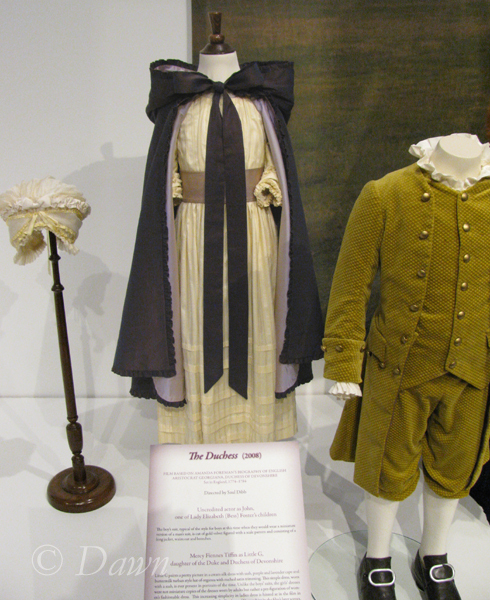 Unlike the boys’ suits, the girls’ dresses were not miniature copies of the dresses worn by adults but rather a pre-figuration of women’s fashionable dress. 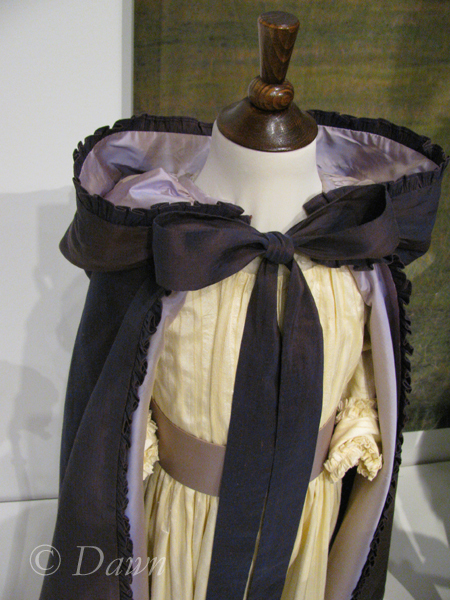 This increasing simplicity in ladies dress is hinted at in the film in the simpler dresses with sashes worn by the Duchess of Devonshire in the film’s later scenes. The two outfits. Although I liked the figured velvet for the boy’s costume, there wasn’t much else that was interesting to me in this one… It might be interesting to look at only for the basic ‘bare bones’ cut of the suit, upon which to add decoration…. The hood on this cloak is huge – possibly to accompany all of the huge hair of the era? 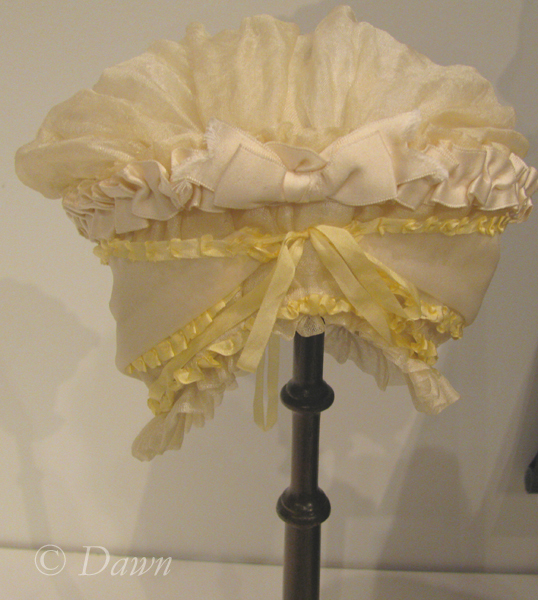 Very pretty bonnet for a child – but too fluffy for me to think of in interpreting in a women’s style! Above is a screenshot from Hotflick. The child on the left is wearing the costume in question. So just a quick note here about blocking pins. Our instructor has two varieties that she’s purchased. 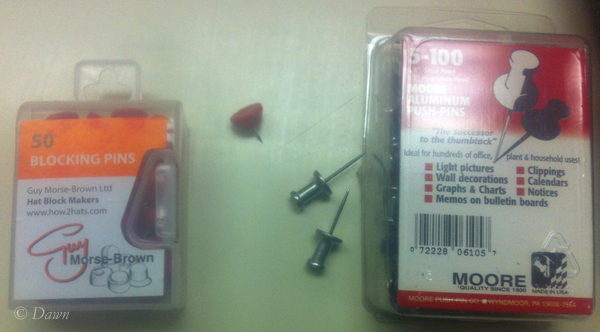 The ones on the left are actually meant as blocking pins – they have the red cap and a short pin. The ones on the right are aluminum push pins and are the silver push pins with the really long pin. Although the red ones are sold as blocking pins, the instructor recommends the silver ones, just because the pins themselves are longer, and the ‘push’ part is easier to take out of a block. I just wanted to do a quick post on this to remind myself, in case I’m ever looking for more pins! In our class supplies we got the silver ones to work with. Well, the other night was my last millinery class (yes, in order to stay in order, this is a seriously scheduled post! I’m actually writing this December 6th!) and I thought that I’d talk a little about it. In the previous class she said we would spend some time working on ribbon flowers, so I brought some beautiful ribbon I picked up. Unfortuantely we didn’t work on flowers at all. It’s kind of disappointing because there are so many beautiful decorations you can make for hats… you don’t need to buy them all ready-made – but I guess we just didn’t have time. We also were supposed to take a group photo with all of our hats, but we didn’t do that either. Instead we put some of the hats that we had brought (work-in-progress or completed) on a Styrofoam head and the instructor took some photos. We had been told that her photographer husband would be coming to shoot, but he wasn’t able to attend because of a (incredibly valid) personal reason. We were also supposed to have a guest speaker – Anita, one of the instructor’s former students, but she too was unable to attend. Being the last class we won’t have that opportunity again. I worked on shaping my green felt a little further, cutting off the brim, shaping it, and reattaching it to the green hat. It’s not anywhere near done – I still need to wire the brim, perhaps add some sort of stiffener to the crown, add the sweatband (and perhaps lining if I do add a stiffener), the hatband, the brim trim (to cover the wire) and any decorations, but at least the bones of the hat are well on their way. I am somewhat nervous about doing too much more without having the blocks though – the shaped crown seems very delicate, and I don’t want to fuss too much with it (especially with steam) without having access to the blocks to re-shape it. Won't this look great with a big plume? I did ask about where to get nice ostrich feathers for my tricorns, and the instructor recommended either The Costume Shoppe (I couldn’t find feathers on their website), or Don’s Hobby Shop (I don’t see them on their website either). The other day I was at PMS Hobbycraft and they do carry some (I don’t see them on their website either), in a few colours (white, red, purple, pink) but they aren’t very impressive, and I think I would like some big, glorious feathers for my tricorns. Another interesting thing – I had asked the instructor about Sinamay a few classes ago, and she left me with the impression that the material I had used before was not the same stuff used for hat-making… but while going through her boxes of supplies, there were small rolls of the same thing – and indeed, the stuff I have IS the same Sinamay used for millinery. Of course, it doesn’t have the stiffener – but apparently this is painted on anyways – and is not part of the material the way buckram with sizing has. The last thing we did in class was some shopping through the instructor’s plethora of materials. I’ll admit that very few of the flowers or feathers she had really appealed to me. However, I did find some really interesting veil material (sort of swirly circles rather than hexagons) in super-dark navy (as long as I’m not putting it on black, I am sure it will pass for black..) some super-wide black horsehair, and some MICRO tubular crin. I also picked up another roll of wire, and have the sneaking suspicion that that might not even be enough for the projects I still have in-progress. While I know that I have expressed some disappointments about this class, I still really enjoyed the class and enjoyed the subject matter, my fellow students, and the instructor. I know how difficult it can be to try to teach people with multiple learning styles, with various level of skill, and various levels of commitment (or interest in the subject matter). Despite the challenges, I still would take the class again, and am looking forward to taking the advanced class in the spring. November 28 was our 7th (and next-to-last) millinery class. It was odd, because only about half the class showed up – I am wondering if so many days off has messed up the schedules for some of my classmates? We were supposed to work on straws and felts, but with the power issues we had last week (ahem… apparently we blew a fuse using irons and steamers and blow dryers all at the same time…) not yet resolved (as in, not fixed) and the missing students, we had a late start. I ended up taking back the green/white/purple straw hood – I just couldn’t think of anything modern and interesting to do with it, and I wasn’t too interested in trying to do something with more of a vintage feel with those particular colours. I had worked on the remaining straws at home (using my kettle for steam instead of a steamer, which worked fine for the reasonably easy-to-shape straws) so I didn’t even bother bringing a straw hood to class (or the big-brimmed straw for that matter either) and instead knew that I wanted to focus on felts. So I took a look at my millinery wish list, and decided that I wanted to try a top hat, so started to think of how it would come together – then the instructor brought out her puzzle block and offered it up, so I jumped at the chance. It’s a 23″ puzzle block, so I had to pad it up with my felt for my big ol’ 24″ head, and began working my red felt hood with the steam. Oh MY it took a LOT more work to shape than the felts! I was having a very hard time smoothing down the crown, until one of my classmates came over to help. Between the two of us and a lot of work, we finally got it down and over. It’s not perfect, but it’s pretty darn good. At that point I had perhaps an inch and a half down the band, and the instructor came over to let me know that the “short” (crowned) capeline was the wrong one to use with this block, and that I would “never get it worked down much further” and that instead of trying to make a top hat, I should “just work with what the fabric wants to do”. I was irritated at that, since I was sure she had seen my choice of block when I raised my hand to have my chance at the puzzle block, when I had padded up the block with my felt, and when I had talked about using the red capeline for the hat… I said that I had no idea it wasn’t appropriate and she responded with “well you never asked”. And here I thought when I said “so… what do I do here? Is it basically just like the straws?” It should have been close enough to asking, since there was absolutely no direction on how to work with the felts. The fact that throughout the class she was saying the same thing to the one classmate who is very far behind might have influenced my frustration as well. My classmate didn’t cover her brim block properly before blocking – and was chastised for it. She used too much water, and was chastised for it. All things that with a little more supervision or direction could have been avoided, instead turned into her just wasting her time and materials. 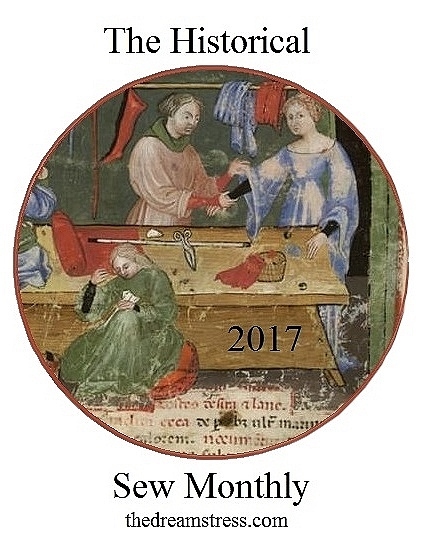 Don’t get me wrong… I’m enjoying the class – and I am sure that the instructor is a fabulous milliner; she just could use more experience as an instructor. Ok.. back to the hat! 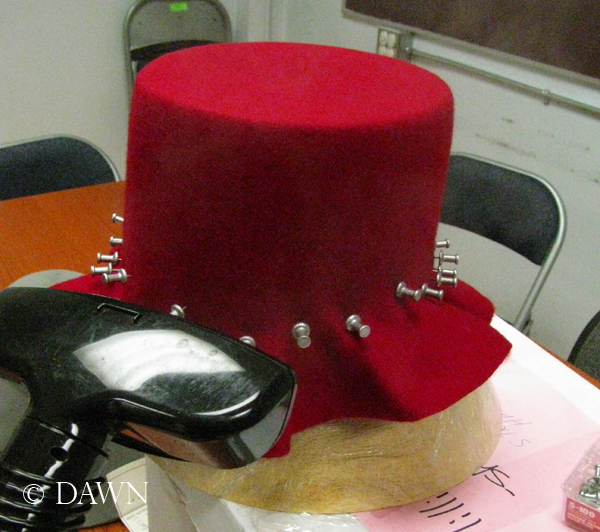 So I knew that I didn’t want to have this tiny little flat crown and a big huge brim with this red felt – I wanted a nice, tall top hat! So… I worked.. and worked… and worked… and worked. 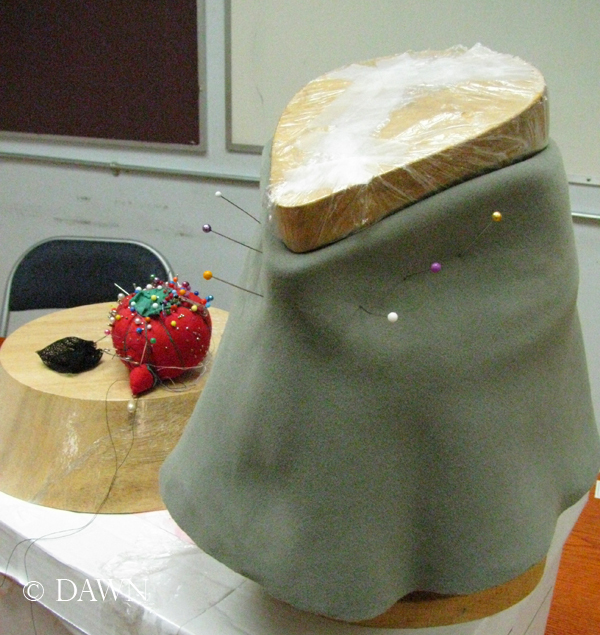 I asked the instructor if pins would show in the finished hat – and she said that in felts they wouldn’t. (Another frustration, once I was done and was taking the pins out, and saw the gaping holes, she said that they sometimes did… and I needed to pin along with the design with the thought of covering them. ARG… this is why I asked!) I pinned down an inch at a time, pulling and steaming the felt to get it to pull down and shrink in along the padded block. Eventually I got it down, much to the instructor’s surprise! From there I didn’t have much material left for the brim, so we started looking at brim blocks. All of the ones that would fit my large crown were entirely the wrong shape, and the one that was the right shape was too small for my crown. Frustrating! I can imagine millinery being an expensive business to start up – since you’d need a variety of head size blocks (in a variety of styles: domed, flat, shaped, etc), and a variety of brims, in a variety of sizes and shapes. I started out using one of the blocks kind of backwards, but it was becoming very tedious and ineffective, so instead I started steaming and hand-shaping the brim instead. I had a feeling that I’d need further work on it and the chance to wire the brim before I could do much more, so I paused at that point to let the hat cool, and started on my second felt hood. 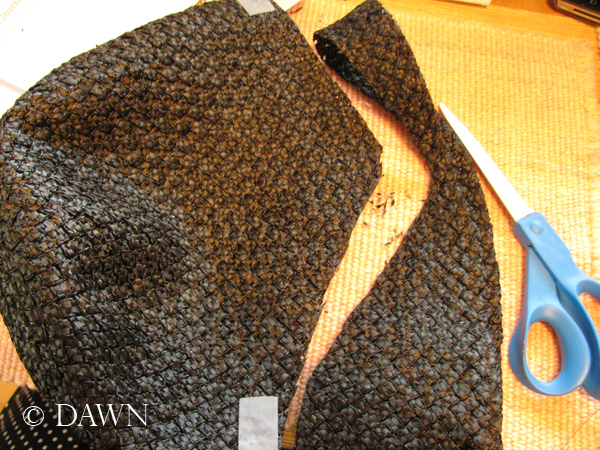 This hood is much shorter – just a hood, not a capeline, which means there’s a lot less fabric to work with. But, it’s the softest, smoothest, high pile felt, and it’s just gorgeous to touch. The colour isn’t anything I would normally wear, but when my hair is red, it will be super pretty I think. I started thinking about playing with the one-piece cloche block, but after my less-than-satisfying experience with the straw cloche, I changed my mind before getting too far along. 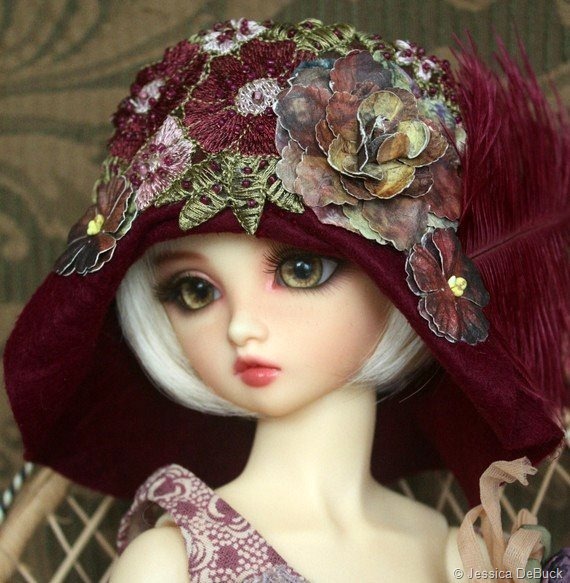 From there I asked the instructor for ideas, and she suggested… cloche. Instead I settled with a fedora-like crown with a tipper to get a really interesting shape in the top. I steamed and set the tip, but that is as far as I got in class, and the hat is still very much a work-in-progress. Since we only have one more class, I will have a lot to work on in order to get things done when I no longer have access to the blocks! Early in the millinery class, the instructor said that we’d be doing cloche’s as one of our projects. 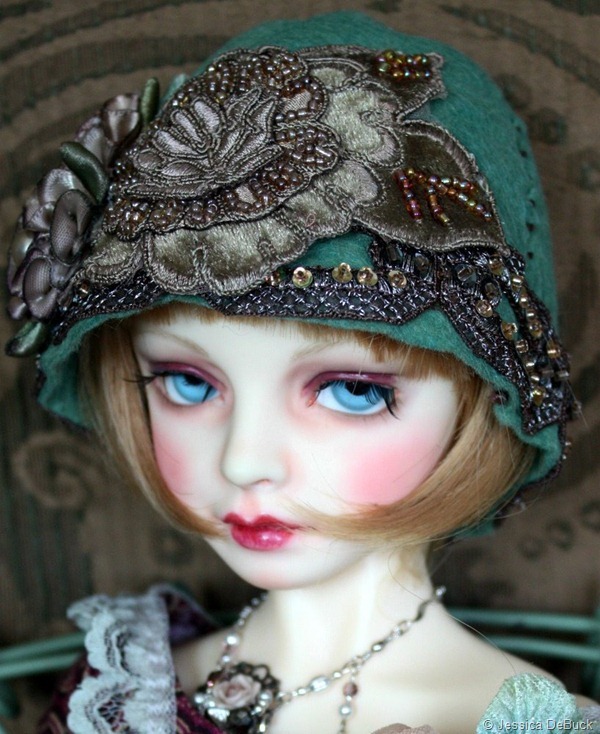 I wasn’t too enthusiastic about that, because I never found a cloche that looked good on me. However, I figured that I would do a little research and see if I could come up with an alternative that might work. My thought was perhaps none of the cloches that I had tried on worked because they weren’t fitted correctly, so if I were to make my own, I could fix that problem. Cloche’s are most well known as the “flapper” hat from the 1920s, however the basic shape of the cloche was in fashion from about 1908-1928 (Fashion Era.com). Helmet-like and closely fitted to the head, the hats were easy to produce because of minimal shaping needed by milliners. 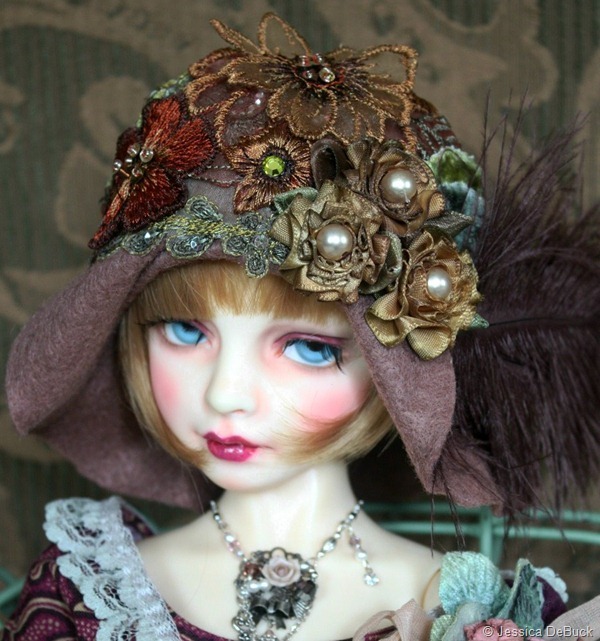 My first inspiration came from the BJD Magazine blog. 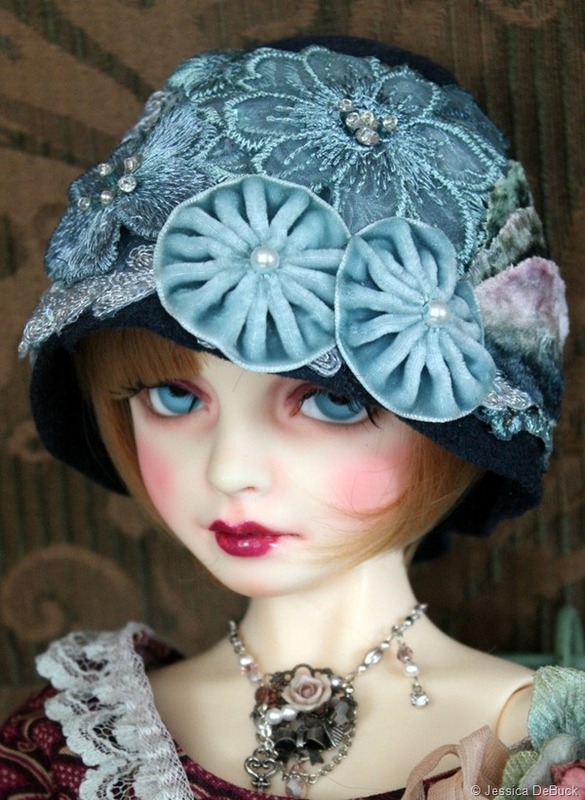 (Ball Jointed Doll) I really liked the shape of the oversized hats and the embellishment, and thought that something like this (rather than the very closely-fitted hats I’ve seen examples of elsewhere). There are also a few examples of nice cloches on the Victorian Trading company website. 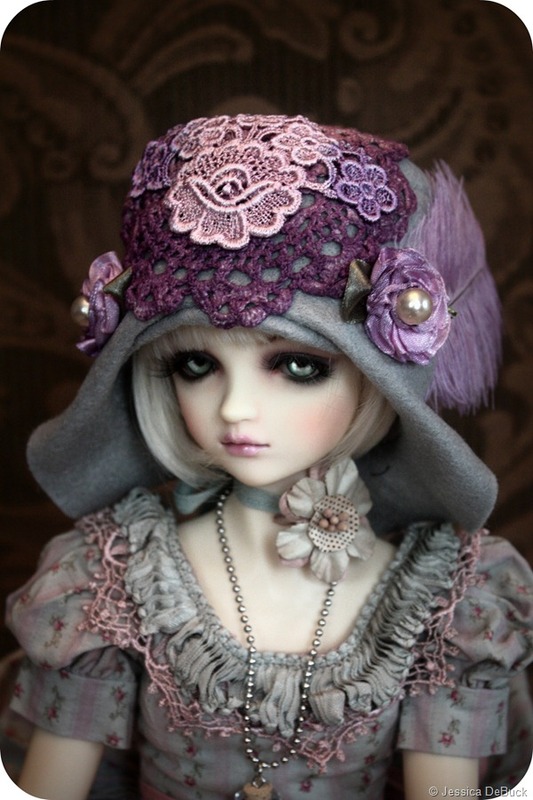 Dark wool cloche (black? green?) 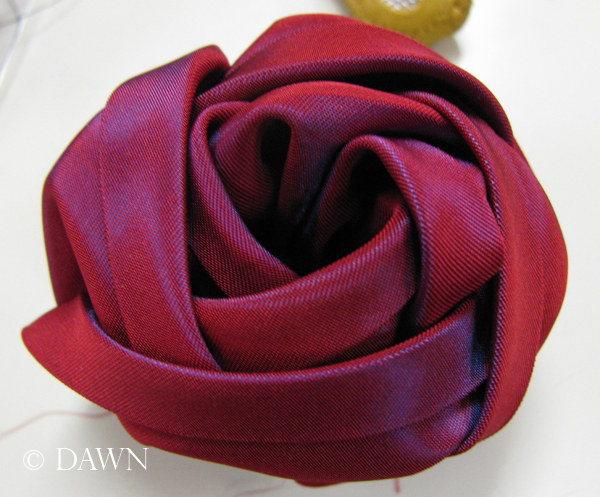 with red velvet ribbon. I like the way the brim is on this, with the little cut out. I found other examples online as well, and really liked ones with elements of beaded fringe (usually a 4″ approx. wide strand of fringe under a bunch of flowers) which seemed really ‘flapper’-like too.. 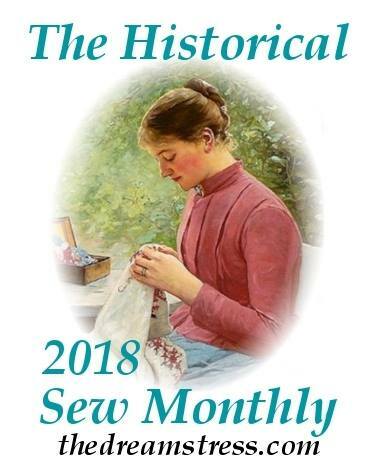 I published this in 2011, but then later on when I was making another hat, I did a little more research, so wanted to add in a few more photos. 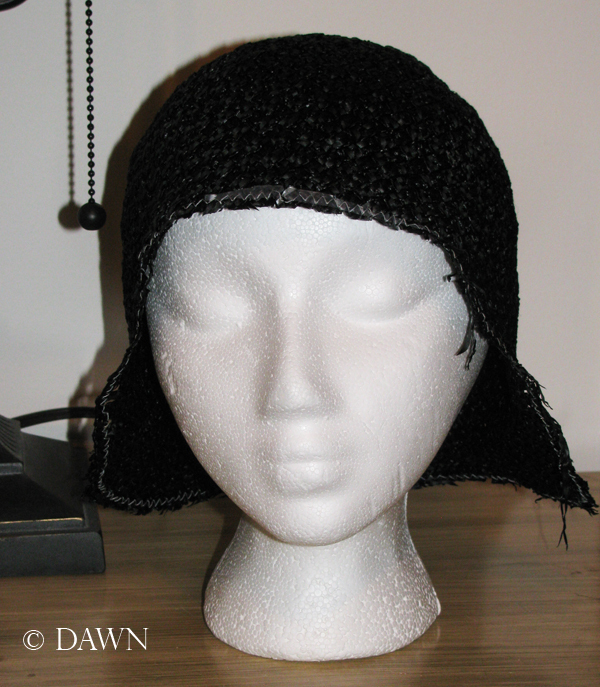 After millinery class #6 I had a black straw to play with, and I decided that I wanted to use it to make the cloche. We hadn’t really had any instruction until then (or after for that matter) on cloches, so I imagine that the instructor’s initial comments about one of the styles we would be doing being a cloche was somewhat wishful thinking rather than lesson plan, but after doing the research and seeing some of the very pretty options, my mind was made up to make a cloche after all! 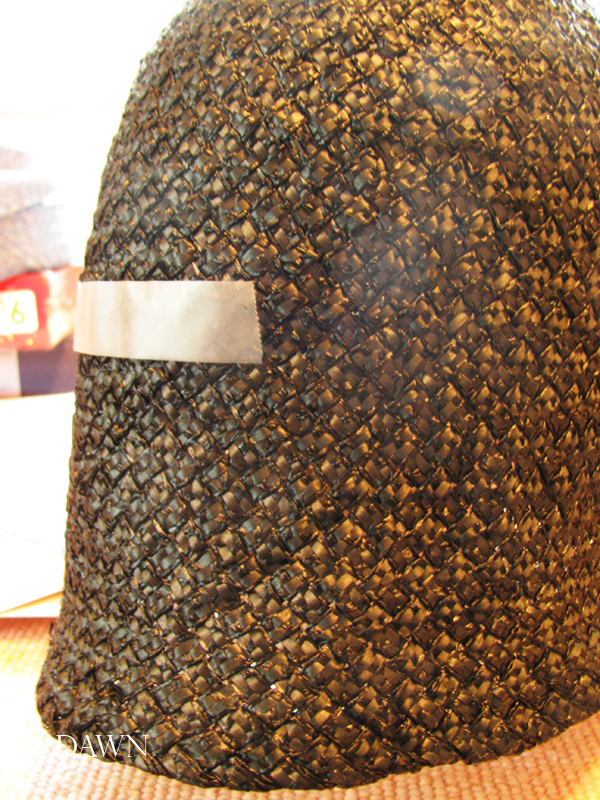 I started with blocking the straw using a head form and steam from my kettle, and got the crown shaped. From there I tried it on and thought it might have been too big, so I put it on my smaller Styrofoam head instead, pulling the straw hood down to re-shape the crown and get more length out of it. Although I can describe this in only a few sentences, it really was more work than just that! From there I tried it on again, and looked in the mirror, marking the areas I wanted to trim. Right above the eyebrows for the front, and dipping up just slightly at the back (to accommodate my ponytail, bun, or however else I want to deal with long hair + short hair style-friendly hat). I kept the sides as long as the hood would allow. From there I folded the hood in half to keep the shape symmetrical (without crushing it of course – while it was still warm from the steam it was quite flexible) and quickly trimmed the hood away. 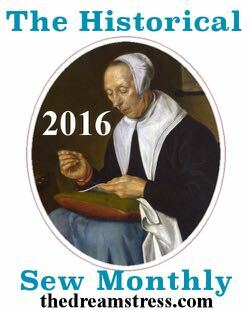 I then quickly took it to my sewing machine to keep it from unraveling – handling it as little as possible. From there, another chance to try on, and really see the shape. I took it back to the steam and reshaped the crown, and tried it on again. But… it looks so cute on my Styrofoam head! It just didn’t look good on me at all! I popped it on my Styrofoam head – it looked so cute! I asked my mom to try it on – it looked so cute! I tried it on me again – and I hated it! I pinned bias tape around the edge, lace, trim… no good, no good, no good! Ultimately, I figured that the head-hugging, low style just doesn’t suit me at all. I am guessing that I have too tall a forehead, and the space between my eyebrows and the visual top of my head is just too long for this style to work on me. It ends up making me look vaguely like a conehead. Boo. So, back to the drawing board with the black straw I went! Hopefully I’ll have a happy ending to share in a future post!